Sears Tower in Chicago was the tallest skyscraper in the world from 1973 to 1998. 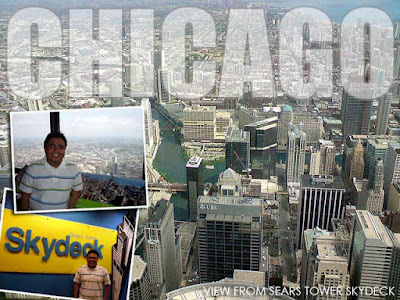 It's still the tallest building in Chicago and a visit to the Skydeck on the 103rd floor which is 1,353 feet (412 m) above ground, is definitely worth the visit. It was our first real day in Chicago since we went straight to DeKalb as soon as we arrived at O'Hare. 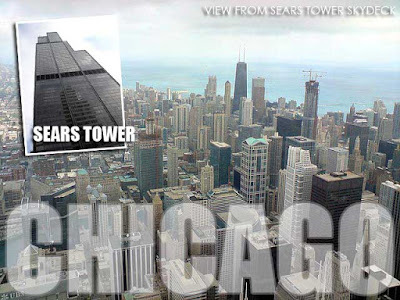 And we had a list of places to visit today, one of them being the famous Sears Tower. They say that up there, you can see up to fifty miles on all sides. It was a great experience looking down at Chicago's magnificent skyscrapers. The city is known far and wide for its architecture which covers more than a century of history. Contemporary structures are properly blended with old historic buildings, standing side-by-side in a harmonious mix of past, present and future. We'll see that in detail when we take the Architecture Cruise later in the month. What looks like the beach and a sea is actually a large freshwater lake called Lake Michigan. Although I've swam in lakes, I've never experienced a freshwater urban beach before (meaning the usual beaches we all know about, the same fun without the saltwater). In fact, the water was so blue, if I did not know it was a lake, I would have mistaken Lake Michigan for a sea. Even the river that runs through the city is very much clean and that was evident from where I stood. 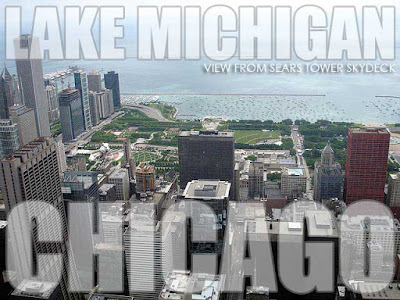 It costs $12.95 to get up to the Skydeck and you can stay there for as long as you want during visiting hours. Wow. I envy you. 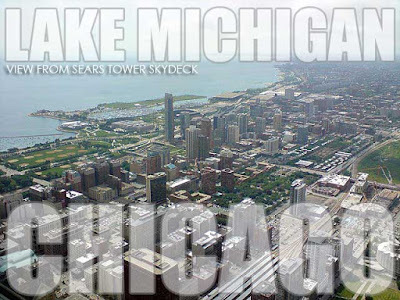 Chicago is one important city in the US that I still have not seen. According to the video, the architects used a stack of cigarettes to imagine the building. Hehehe! Really? I watched got my information from the Discovery Channel some time ago.. hmmm..